Here comes one interesting filing. Snapchat's hotly anticipated IPO is quickly rounding into focus. 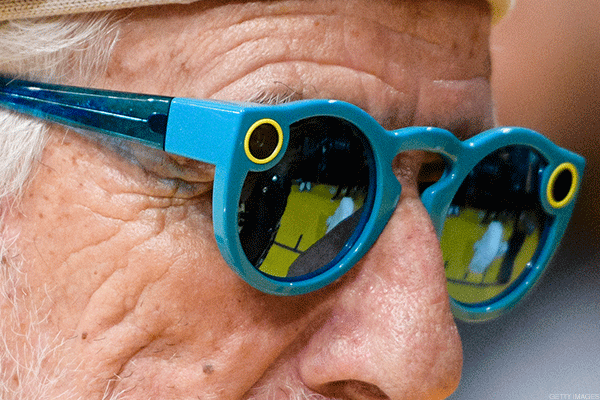 Parent company Snap Inc. is due to reveal its financials via a regulatory filing within a week, according to a new Bloomberg report. The filing would be a natural progression for the secretive, relatively young tech company. Snap has already held meetings with prospective investors, according to a December report from The Wall Street Journal. Snap reportedly filed confidential paperwork on Nov. 15 regarding the IPO. Morgan Stanley (MS - Get Report) and Goldman Sachs Group (GS - Get Report) as the lead underwriters, for an IPO that could value the company at as much as $25 billion. Revealing its financials to the public would go a long way to show if Snap could support such a heady valuation. Although Nasdaq has remained favorable with tech companies, the rivalry between Nasdaq and the NYSE has only become fiercer over the years as more than 60% of tech companies have chosen to list on the NYSE over the last four years compared to when in 2006 it only had 12% of all tech IPOs . Companies like Twilio (TWLO - Get Report) , Square (SQ - Get Report) , Line (LN - Get Report) and GoDaddy (GDDY - Get Report) have run counter to preconceived notions to join Twitter (TWTR - Get Report) , Yelp (YELP - Get Report) , Box (BOX - Get Report) , and Oracle (ORCL - Get Report) on NYSE. The race between the two exchanges continues to heat up. Snap is expected by many to choose the Nasdaq as its listing site just as former tech darling Facebook (FB - Get Report) had done. But as many experts say, the choice is less of a foregone conclusion as the New York Stock Exchange has implemented a number of changes over the past few years and presents a number of benefits over the Nasdaq. Still, Nasdaq is no slouch and the competition will certainly take place to land one of the most high profile listings in recent history. Meanwhile, both exchanges continue to promote Snapchat on their Twitter accounts likely to try and curry favor with the company's executives. So, how do companies choose which exchange to list on and what benefits do each provide? How did the Nasdaq become the defacto destination for tech companies and how is the NYSE competing with its uptown brethren? There are a number of reasons. Although Nasdaq has had a higher number of tech IPOs, the ones that succeeded in raising the vast majority of capital to help companies grow, expand their businesses, pay down debt or provide meaningful liquidity events for investors have almost exclusively listed on the NYSE, according to John Tuttle, Global Head of Listings at the New York Stock Exchange. Last year, companies that listed on the NYSE raised about $11.3 billion from 33 IPOs while Nasdaq won 81 of the 111 IPOs, (73% win rate) raising $9.4 billion. "The majority of companies on Nasdaq are actually quite small. If you look at the median market cap, if you look at all of the companies listed on the stock exchange, and all of the companies listed on Nasdaq, the median cap for companies listed on the NYSE is roughly $2.4 billion, for Nasdaq it's under $300 million," said Tuttle. Back in the 80s and 90s, the NYSE focused on older and more established blue chips companies, its stringent and restrictive rules disqualified many of the then up-and-coming tech companies. "In 1983 the tech companies were just starting to grow. They weren't big enough to pass the listing requirements on the American and New York [stock exchanges]. By the time they were big enough to switch, the rule had changed and Nasdaq effectively convinced them that. They now offered the same trade info as the other exchanges so switching wouldn't get them much," said Daniel Weaver, professor of finance at Rutgers Business School. "I have taken three technology companies public, all of them on Nasdaq. Over the past decade, Nasdaq has consistently demonstrated their alignment with Coupa's core values of ensuring customer success, striving for excellence, and focusing on results. Thus, the partnership is a natural fit," said Todd Ford, CFO at Coupa Software (COUP - Get Report) , which went public in October raising about $133 million. Editors' Pick: This article was originally published on Nov. 16 and has been updated to reflect recent news about Snap's IPO plans and new app developments. While some companies like the exposure of Nasdaq's electronic billboard in Times Square, others prefer to have NYSE's human oversight and accountability in the mix. "There are some people who like NYSE's hybrid mix of electronic trading plus human intervention. It gives some investors comfort of being able to buy or sell during periods of high volatility," said Ken Marlin, Managing Partner at Marlin & Associates Securities LLC. "NYSE is 200 years older than Nasdaq. Some people like the message that sends." The competition has set off Nasdaq to invest more in entrepreneurship and innovation. The Nasdaq Entrepreneurial Center, which was established only a year ago in California has already educated 3300 entrepreneurs on startup law, accounting and marketing. "We've been in the Silicon Valley for 25 years. If you look at the companies that are listed in the Western region that I oversee, the market cap of all those combined companies is $4 trillion," said Jeff Thomas, Vice President and Head of Western Region Listings at Nasdaq. Nasdaq has continued to attract technology-focused companies since its inception in 1971 as the world's first electronic stock exchange. According to recent statistics from the Nasdaq, 82 percent of technology IPOs listed with Nasdaq last year, with 91 percent of them being venture-backed new listings. "Many tech companies like the aura associated with the many successful tech companies that listed on Nasdaq and never left, such as Apple (AAPL - Get Report) , Alphabet (GOOGL - Get Report) , Facebook, Microsoft (MSFT - Get Report) , and Amazon (AMZN - Get Report) , the top 5 market cap stocks," said Jay Ritter, finance professor at the University of Florida. Although it is hard to pick a clear-cut exchange winner in the tech IPO space of 2016, as a strong pipeline of big tech names like Uber, Airbnb, Pinterest, Spotify and Dropbox are expected to come to the public market, the race between Nasdaq and NYSE to win over and seat those companies is not going to slow down anytime soon. Alphabet, Apple and Facebook are holdings Jim Cramer's Action Alerts PLUS Charitable Trust Portfolio. Want to be alerted before Cramer buys or sells GOOGL, AAPL or FB? Learn more now.